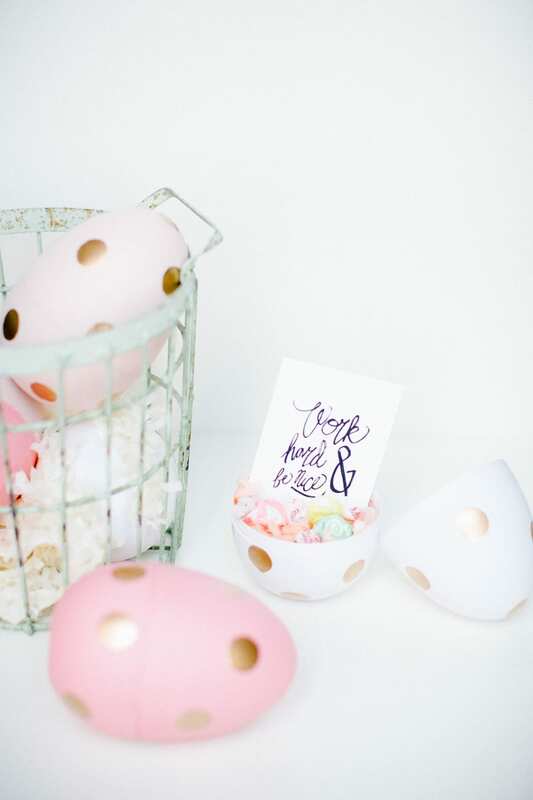 DIY: Jumbo polka dot easter egg favors just for adults! Ohhh how I love surprise favors! I’m kind of like a child deep down and not just because I’d rather have sugar before dinner, but because you’d actually find me hunting Easter eggs with the three year olds instead of hiding them with the adults… among other things. 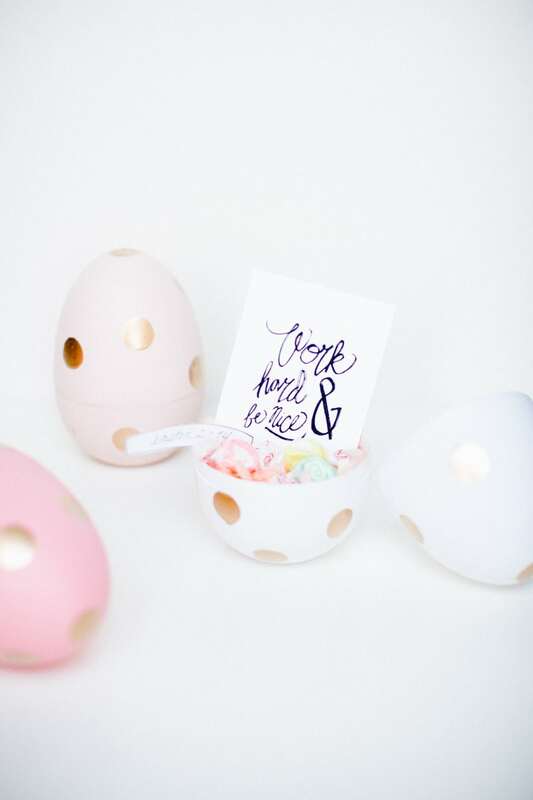 The point I’m trying to make here is that you can high five the inner child of all of your guests on Easter Sunday (as seen in action here) by passing out these DIY jumbo polka dot Easter egg favors filled with goodies even adults will be giddy over, like mini Minted art prints. 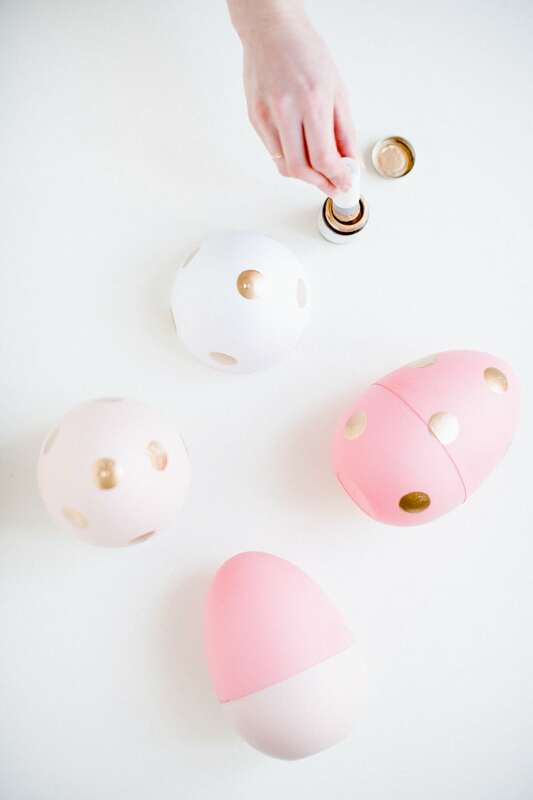 First, spray paint the plastic eggs the colors of your choice by breaking the eggs apart and painting each end separately to get the inside and outside (this way the entire egg is the same even when it’s opened). Let them dry completely and put them back together, you can even mix and match colors like I did to create the color blocked look. 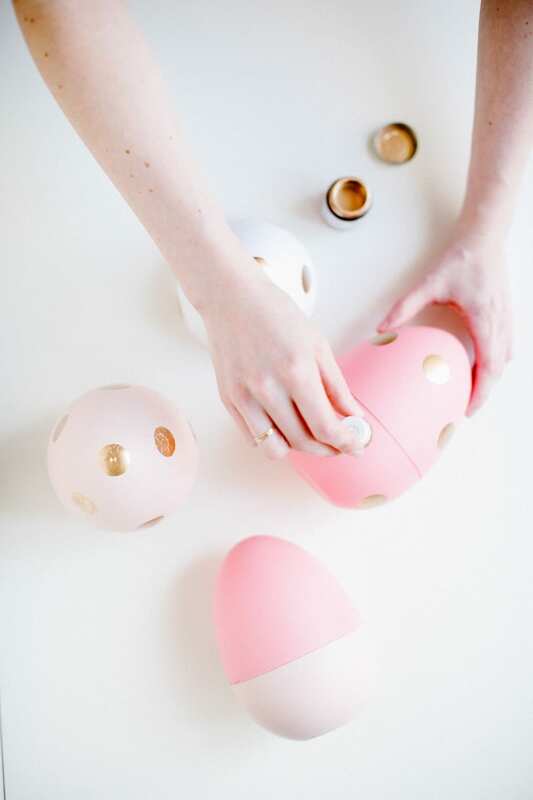 Now use your foam pouncer and gold leafing to dab mini polka dots all around the egg, being careful to not touch freshly inked dots! These particular eggs have flat bottoms which makes it easy to stamping around them. 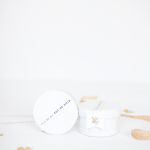 Let the gold leafing dry and then stuff them with filler, candies, and you favorite mini Minted prints! 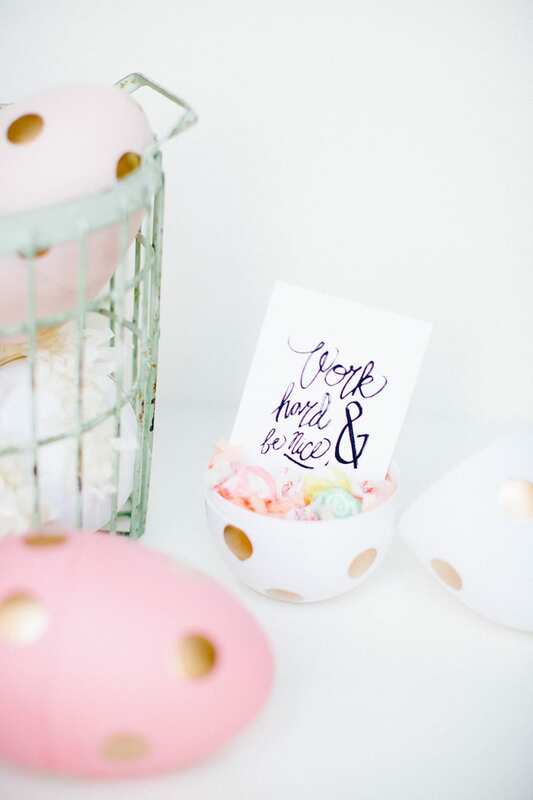 Sit them out in a cute pastel basket for guests to grab on their way home. I’m soooo glad I convinced myself this mint green metal basket was a necessity when I was in Round Top last year, totally came in handy! 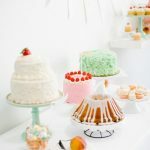 In case you missed our Easter dessert spread featuring these little jumbo guys, you can catch all of the details here! So cute! 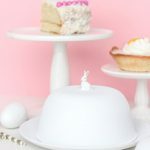 Great DIY idea for Easter. 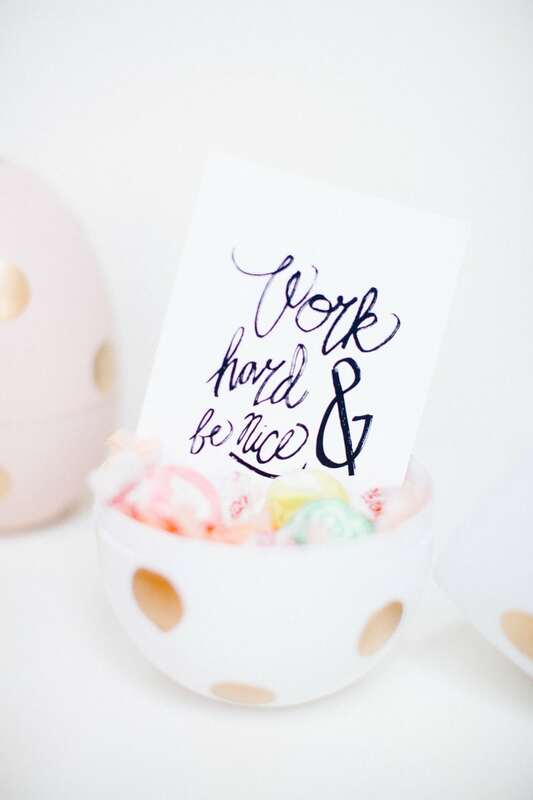 So stinkin’ cute and so simple! 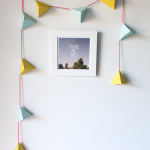 Such a lovely idea – love them! Did you spray paint the inside of the eggs too? Which brand of spray paint did you use? I tried to spray paint it with Rut-oleum and the color is just not as nice as yours.